A Queens dad is suing a rabbi, claiming his son was disfigured during a bris in October 2011. FOREST HILLS — A Queens rabbi botched the bris of an 8-day-old boy, then told the dad that he did an acceptable job, even though the infant needed corrective surgery, a new lawsuit charges. Gavriel Barukh, the father of the boy, is suing Rabbi Mordechai Rachminov, claiming he sliced off part of his son's corona glandis during the religious ceremony on Oct. 16, 2011, at the Bukharian Jewish Community Center in Forest Hills, according to the lawsuit filed last week in Queens Civil Supreme Court. After the ritual, Rachminov, 69, misled Barukh by claiming the circumcision was "performed appropriately and that his conduct was within the standard of care and skill required of Jewish mohelim and circumcisers," the lawsuit says. He also allegedly told Barukh that a physician wasn't necessary. Even after it became apparent that the bris went awry, Rachminov and the community center failed to call a doctor, the suit says. Barukh claims that the delay in medical treatment resulted in greater permanent damage to his son. The boy had to undergo corrective surgery with general anesthesia and may need even more procedures, the lawsuit says. A woman who answered the phone at Rachminov's home said the allegations weren't true. "I didn't hear any of this," she said. The Bukharian Jewish Community Center was also named in the lawsuit. A woman who answered the phone at the center said Rachminov no longer works there. She declined to comment about the lawsuit. Barukh's lawyer did not return a call for comment. The practice of performing a bris became a hotly debated topic in September after an infant died from contracting herpes during the ritual. The city Health Department said at the time that since the year 2000, 12 babies have contracted the virus during the religious ceremonies. Last fall, city officials enacted a rule requiring parents to sign off on a bris before it can occur. Jewish groups are currently challenging the rule in federal court. The rituals are mainly practiced by Orthodox Jewish communities. 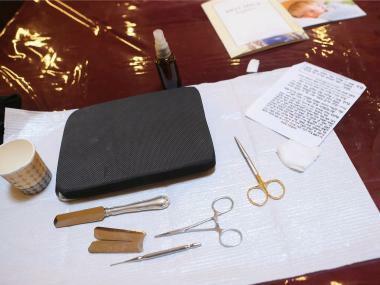 They involve a rabbi or mohel excising the baby's foreskin, then sucking out blood from the cut with his mouth. The contact is how herpes can spread to the child.